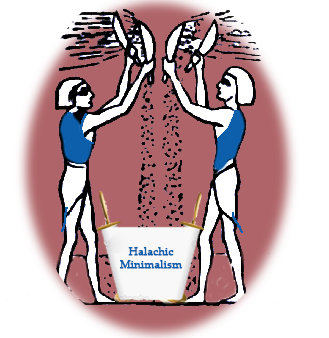 Halachic Minimalism: Path to Unity? "Open Orthodoxy" has been in the news a bit lately. And I was recently pointed to this well written article by one of it's "founding members"
I think the differences between "Open Orthodoxy" and what I call "Halachic Minimalism" is important, and also demonstrate many of the principles, of having a minimal framework for Halacha that all can work with. Many people might think that Open Orthodoxy and Halachic Minimalism are really two names for the same concept, but in reality, they are worlds apart. Firstly, some important things to point out. Shmuly Yanklowitz's article on open orthodoxy is different from some of his other articles in one key way, it doesn't go into details. Which means, if you read the comments, people point out that his "open orthodxy" doesn't just use Halacha to inform his social justice (as I think it should) , but also his ideas of social justice influence his halacha. (which I find problematic, but halachic minimalism should not) Mainly, in regards to his public statement that maybe we don't need the Temple anymore, and mourning it is a bad practice, as well as creating what he calls "Vegan tefilin" which just means, making tefilin out of animals that died naturally, rather than using a cow which was slaughtered to be eaten. And this is where "Halachic Minimalism" kicks in. I will admit that I'm not aware of all the relevant sources, but I imagine, that I could not find even one, which suggests that the Beit Hamikdash is not needed, or will not be needed in the future. Numerous halachot and minhagim center around the mourning of the loss of the temple, not just the loss of life which happened at that time. (i.e. breaking the glass at the wedding, which even the most liberal weddings still seem to have.) From the standpoint of Halachic Mimamlism, one must stand up and say "We miss the temple, not just what it represents"
On the other hand, the "vegan tefilin" are halachically 100% kosher. One might be worried, that it's based on an attitude, that killing an animal, even if for a good purpose, (the fullfilment of a halacha) is something to be avoided. People who feel that way would have "what to rely on" as they say. There are many sources which declare that using animals for good purposes, is a worthy goal, not just an allowance. However, no matter what is motivating the decision, the fact remains that Vegan Tefilin are 100% kosher tefilin. One who supports Halachic minimalism can not stand up and say, "We must have kosher shechitah for our tefilin", but what they can say is that "I want my tefilin made from an animal which was slaughtered via shechitah, and is not a neveilah" That is the right for every Jew, to fulfill the halachot in a way that makes most sense to themselves. What was very telling to me in the comments of the article I linked to at the top, is that there was an effort to discredit "Open Orthodoxy", not based on the premise of Open Orthodoxy ("social justice") but rather they wanted to know, if Open Orthodoxy lead to any ideas or behaviors which were not allowed. In my view, this is entirely the wrong approach. The correct approach is to say, "Open Orthodoxy sounds good", or "I don't like the idea of Social Justice, and therefore open orthodoxy sounds bad. ", or "Centrist Orthodoxy does social Justice just fine.". And then, on the particulars of the Temple, or Vegan Tefillin, or Torah not from Shemayaim, one has halachic conversations about those details. The movement as a whole, does not need to be attacked on the particulars of a mitzvah. Better to support the movement, and argue that where they advocate things which violate halacha, that those things be corrected. Sometimes the premise of a movement does in-fact violate halacha, but even then, perhaps there is room to rework the premise in such a manner so that it does not.